This dreamy ocean view wedding in Mosman for Ellie and Nick melted our hearts the minute we walked into the room. The minute we first spoke to Ellie we became so excited by her vision. She wanted simple but elegant with whites and greenery. Sergeants Mess speaks for itself when you walk in and have floor to ceiling views of the Sydney Harbour but Ellie’s styling team created something so incredible with over the top white flowers and lots of pastels greens. The immaculate Floral details, beautiful tables decorations with little olive oils as gifts and a one of a kind view had us speechless. We wanted the 6 tier Cheese Tower to standout but also blend in with the rest of the theme. We picked 6 cheeses that complement the style and colours of the wedding but also tasted incredible. The cheese selection was the following Monte Veronese Di Malga DOP, Artisan Lou Bergier Cheddar, Organic Hoddle Brie, Pecorino Toscano DOP, Simme Blue and Brillant Savarin. All hand selected from Artisan Cheese Makers. 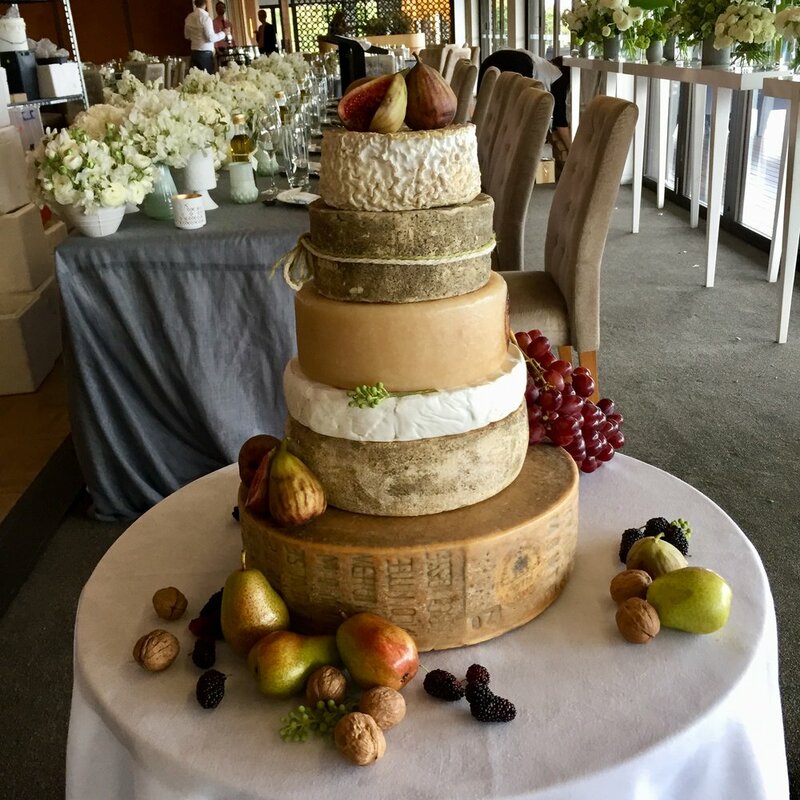 We wanted to let the cheese shine so we decided the room was full of so many beautiful florals that we would put beautiful seasonal fruit on the Tower. This included Black Mission Figs, Mulberries, Purple grapes & Mini Limonera Pears. We added hazelnuts and Bittersweet green mini berries and it looked incredible. The Tower was served with water crackers and pastes - Tamarind, Cumquat, Quince & Fig. We couldn’t be happier for Ellie & Nick. We wish them a whole world of long lasting happiness.